When the 2017-18 season ended against Bloomfield (N.J.) College in the semifinal of the East Regional, Ryan Boulter was just two points shy of the 1,000-point mark for his college career. The former Mansfield standout and Hockomock League MVP, who scored more than 1,300 points for the Hornets, wasted no time in reaching the milestone this year. In fact, it took only one shot. 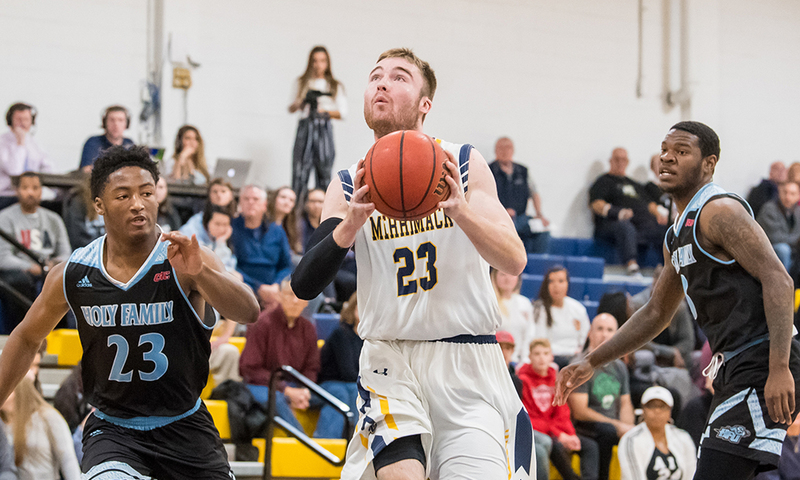 The Merrimack College senior forward made a back cut down the right side of the lane for an easy layup just 30 seconds into the season opener against Holy Family University (Pa.). “I wanted to get it out of the way early, but I didn’t expect to get it on the first basket like I did,” Boulter said in a phone call on Friday morning. Boulter led the Warriors with 19 points in the 69-50 win over Holy Family and was the 45th player in program history to reach the 1,000-point mark (junior guard Juvaris Hayes also reached that mark last season). The milestone meant even more for Boulter because coming out of high school there were questions about his ability to play at the Div. II level. He received few looks from schools outside of Div. III until longtime Merrimack coach Bert Hammel (who passed away this October) offered him the chance to come to North Andover. It didn’t take Boulter long to prove that he deserved the chance to play in Div. II. The 6-foot-7 forward came off the bench in 23 games during his freshman season, averaging six points per game and shooting more than 38 percent from beyond the arc. Boulter took off in his sophomore season under new head coach Joe Gallo (who took over when Hammel retired), earning third team All-NE-10 honors as Merrimack’s leading scorer at 18 points per game. There were high expectations coming into last season and Merrimack largely lived up them as a team, winning 20 games, but Boulter was sidelined for a dozen games in the middle of the season with a foot injury. Despite the setback and dealing with the first significant injury of his basketball career, he was still second on the team with more than 13 points per game and shot more than 43 percent from three-point range. The injury provided extra motivation for this season. The Warriors were ranked second in the preseason NE-10 coaches poll, behind St. Anselm, are expected to challenge for the conference title, and to make a run in the postseason. After missing time as a junior, Boulter is ready to get back to the all-conference level he reached as a sophomore. Watch highlights of Merrimack running its offense and you see players constantly switching positions, spreading the floor, making cuts to the basket, and stretching the defense all across the court. “It’s incredible because we don’t care about who’s the leading scorer each game, we just care about winning and focusing on our goals,” Boulter said. The Merrimack system also looks very similar to the offense that Boulter was part of at Mansfield, where he and the Hornets compiled a 72-9 record over his career, reached a state title game (where Boulter, just a sophomore, hit three free throws in the final seconds to force overtime against Putnam) and two sectional finals. Boulter carried that culture of success, and the knowledge of what it takes to win games, into his collegiate career. Last winter, Mansfield won its first ever state championship and Ryan’s younger brother Tyler played a critical role in the Hornets’ tournament run. Ryan had several close calls, including the overtime loss to Putnam in the final and a pair of thrilling match-ups with loaded Catholic Memorial teams in the South sectional, and he was excited for his brother being part of the first Hornets team to reach the pinnacle. “I was very happy for him,” Boulter said. “He kind of had to live up to high expectation being my little brother, but I was really proud of him. He played his heart out and I was really happy that he won it. It is only three games into the new season (Merrimack played Bentley on Saturday afternoon) but Boulter is already seeing signs that the Warriors can reach their goals this year – winning the NE-10 title and getting out of the East Regional. He pointed to the 72-42 win against Assumption on Wednesday night as an example of what the team can achieve. The season started with a personal milestone, but Ryan Boulter is focused on ending the season, and his Merrimack career, with an even bigger prize – the NE-10 title. Ed. Note – Merrimack suffered a 65-59 loss at Bentley on Saturday to even its record at 2-2. Boulter scored six points in 37 minutes, shooting 2-of-6 from three.